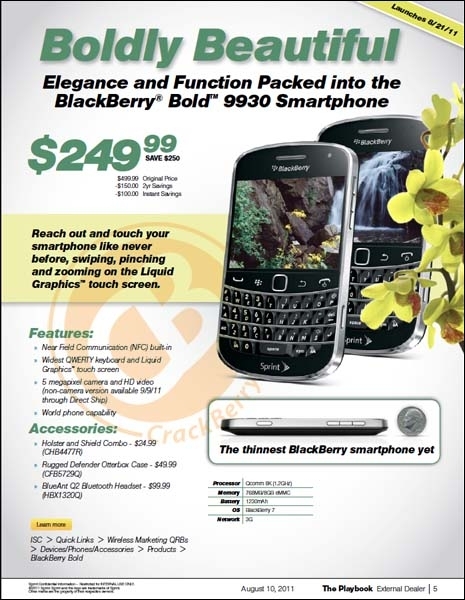 Sprint BlackBerry Bold 9930 launching August 21 | BlackBerry Blast! Sprint will launch the BlackBerry Bold 9930 on August 21, along with the BlackBerry Torch 9850. Sprint announced the Bold last week, but no firm date was given. Now, thanks to the Sprint Playbook, we have the firm date. Sprint will charge $250 on contract for the Bold 9930 which is a pretty hefty price to pay for a BB. The Torch 9850 will sell for $150 on contract which is much more reasonable. Will you cough up $250 plus a 2 year contract just for a touchscreen Bold, or will you opt for a full touchscreen device at $150?